So what were we watching in ex-FBI Director James Comey’s testimony on Thursday: an upright public servant punished for resisting a power-mad President or a participant in a political scheme to use the law as a way to overturn a U.S. presidential election? There was a consensus in the mainstream media that it was the first, that Comey was the noble victim and President Trump the conniving villain. And, surely, Trump could be criticized for his clumsy firing of National Security Adviser Michael Flynn and ensuing expression of “hope” to then-FBI Director Comey that Flynn would not be punished further. 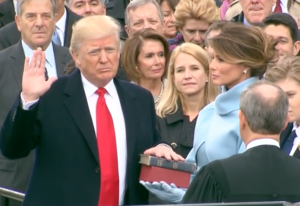 But – outside the view of the MSM – there are other troubling aspects of what is now unfolding, including the scene of FBI Director Comey informing President-elect Trump on Jan. 6 about a defamatory annex to an intelligence report detailing unproven but salacious allegations and then seeing those details leaked almost immediately to humiliate Trump in the days before his Inauguration. 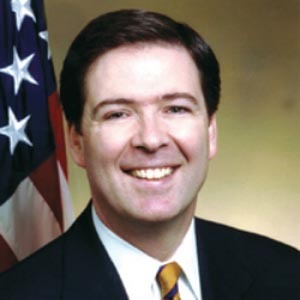 In his Thursday testimony, Comey defended his role in alerting Trump to the Intelligence Community’s publication of the allegations, which summarized opposition research done to benefit Hillary Clinton’s campaign and alleging that Trump had hired Russian prostitutes to urinate on him as he lay in a bed once used by President and Mrs. Obama at the five-star Ritz-Carlton Hotel in Moscow – while supposedly secretly videotaped by Russian intelligence. “I remained alone with the President-elect to brief him on some personally sensitive aspects of the information assembled during the assessment. “The I.C. leadership thought it important, for a variety of reasons, to alert the incoming President to the existence of this material, even though it was salacious and unverified. Among those reasons were: (1) we knew the media was about to publicly report the material and we believed the I.C. should not keep knowledge of the material and its imminent release from the President-elect; and (2) to the extent there was some effort to compromise an incoming President, we could blunt any such effort with a defensive briefing. Given the mainstream media’s determined promotion of Russia-gate as a legitimate scandal, the extraordinary nature of this briefing incident has passed largely unnoticed. In other words, just as Comey said he inferred an improper or illegal order when Trump expressed “hope” that Flynn’s legal ordeal might end, Trump might well have deduced that Comey’s elevation of the urination story amounted to coercion or blackmail from the Intelligence Community. Trump, who surely knows the shadier corners of the construction trade, might have heard something like, “Gee, we’d hate for your wife and children (not to mention the rest of the world) to hear this story about prostitutes peeing on you” – and read the warning as a threat. 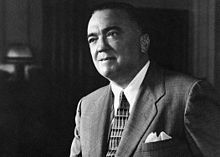 FBI Director Hoover was a master of just this sort of warning, conveyed as a sincere concern about some politician’s well-being. Trump, who has emphatically denied the salacious accusation, could well have seen Comey sending him a message from the leaders of the powerful Intelligence Community that they were determined to remove Trump or at least politically cripple him. In the five months since the Jan. 6 briefing, Trump has gotten a taste of how accurate Schumer’s observation was. Making sure that the public got to read the “dirty dossier” – compiled by ex-British spy Christopher Steele and financed by some still unknown Clinton supporter – was clearly one of those six ways. On top of that, Obama’s intelligence chiefs, including Comey, have testified repeatedly before Congress while they or their allies have leaked derogatory information about Trump to The New York Times, The Washington Post and other mainstream news outlets. So, this side of the story remains unspoken, a silence made possible by the fact that most of the nation’s top news executives and much of its political elite share the opinion that Trump’s presidency must be ended and a more traditional chief executive installed. But no one in authority wants to acknowledge that a “soft coup” is in the works because that would make America look like a banana republic to the world. It also could infuriate Trump’s 63 million voters who might take exception to this sort of “deep state” veto of a duly certified election. So, what that means is that the planned removal of Trump will be a deliberate process cloaked in high-minded legal principles and much talk about the rule of law. Of course, Trump would not be the only loser in this process. His sinking presidency would drag down many of those around him – and, in the case of Michael Flynn, might well lead to criminal charges. Indeed, if civil libertarians were not largely committed to the anti-Trump #Resistance, they might pause for a moment and consider the disturbing picture of what was done to retired Lt. Gen. Flynn. To engineer the ouster of Flynn as Trump’s first National Security Adviser, President Obama’s Justice Department holdovers used the archaic 1799 Logan Act as a predicate to justify an FBI interrogation of Flynn about the details of a phone conversation with Russian Ambassador Sergey Kislyak on Dec. 29, 2016, while Flynn was vacationing in the Dominican Republic. Since the FBI agents had a transcript of the intercepted phone call and Flynn was working from memory – possibly a bit hazy from a Pina Colada or two – Flynn was an easy mark for a perjury trap. Leaving out some detail, whether intentionally or not, would open him to an obstruction case – and Comey reportedly has indicated that the ongoing criminal investigation of Flynn indeed relates to whether he withheld information from investigators. Every American who is concerned about the future political use of the U.S. intelligence agencies’ powerful surveillance tools should have shuddered a bit over what was done to Flynn. But many on the Left so desperately want Trump removed from office that they have joined the Russia-gate stampede as the best way to trample Trump. So, few tears have been shed for Flynn even as he was ambushed based on transcripts of National Security Agency intercepts, a precedent that could be replicated in many other circumstances against American citizens who get on the Intelligence Community’s “six ways from Sunday” black list. The use of the Logan Act predicate should have set off other alarm bells. 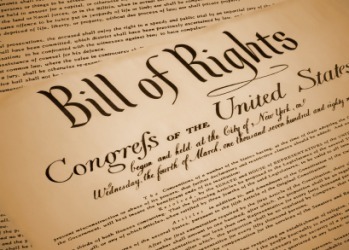 The law, which was enacted during the Alien and Sedition Act period, was meant to stop private citizens from trying to conduct U.S. foreign policy on their own, but its constitutionality was always suspect and it has never led to a prosecution, not one in 218 years. 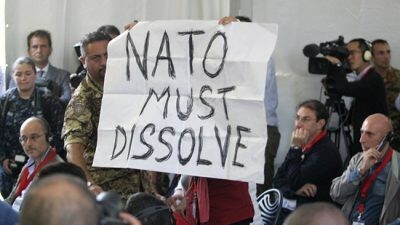 It was also never intended to apply to incoming foreign policy officials of a new presidential administration after the election, when they are understandably beginning to make contacts with foreign officials. So, for then-acting Attorney General Sally Yates to have dusted it off as a predicate for going after Flynn suggests additional entrapment problems. True, Flynn may have used poor judgment in how he handled a 2015 paid speaking engagement in Moscow, how he reported on his consulting work for a Dutch company owned by a wealthy Turk with high-level political connections, and what he might have said to Kislyak (although we still don’t know the details of that conversation). 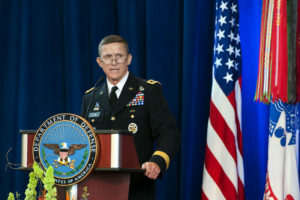 But Flynn also had been an Army lieutenant general who led the Defense Intelligence Agency in 2012 when it produced the U.S. government’s most perceptive critique of President Obama’s proxy war in Syria, even predicting the emergence of an “Islamic state,” a judgment that annoyed other intelligence leaders who were participating in the covert war to overthrow the Syrian government. 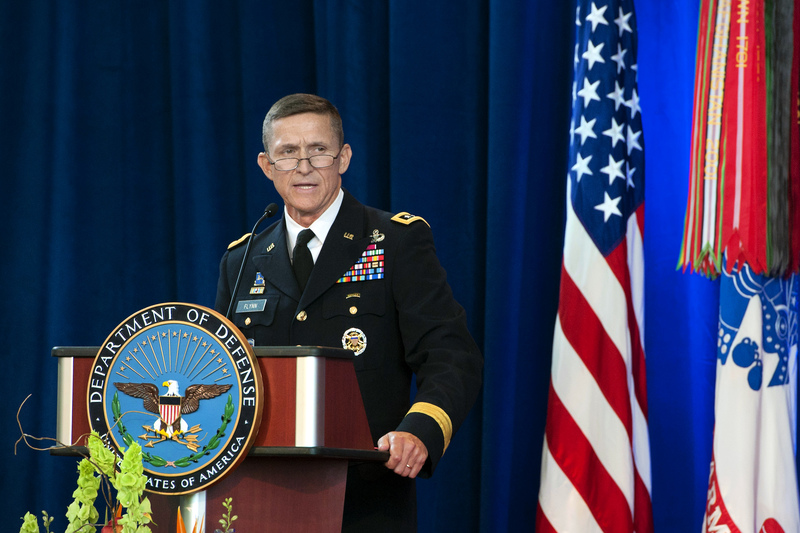 After being forced out of his DIA job and retiring from the Army in 2014, Flynn went even further in a 2015 interview when he said the intelligence was “very clear” that the Obama administration made a “willful decision” to back these jihadists in league with Middle East allies, a choice that looked particularly stupid when Islamic State militants started beheading American hostages and capturing cities in Iraq, forcing the reintroduction of U.S. military troops. However, out of a job, Flynn scrambled around for additional income, including signing up with a speakers’ bureau and forming a consulting company, as many other national security veterans have done. In perhaps Flynn’s most controversial decision, he accepted a speaking fee of about $45,000 to address the tenth anniversary dinner for Russia’s RT network in Moscow, sitting next to President Vladimir Putin for part of the evening. Given the Obama administration’s heightened hostility toward Russia, Flynn’s appearance drew some high-level criticism. Flynn further antagonized Obama’s team by signing up with the Trump campaign and then joining the “lock her up” chant at the Republican National Convention directed toward Hillary Clinton. 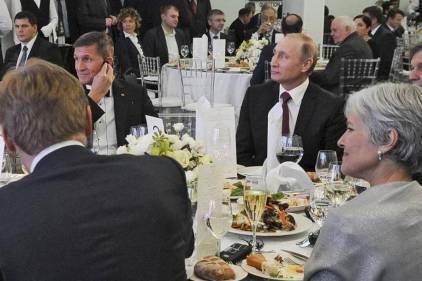 In the wake of Clinton’s shocking defeat and amid the Intelligence Community’s claims about Russian interference in the election, Flynn’s friendly relations with Russian leaders made him an obvious target. However, amid the mainstream media’s increasingly frenzied talk about Trump’s potential impeachment, this other remarkable story – how the U.S. Intelligence Community is moving to reverse the outcome of a presidential election – is getting ignored in plain sight.